We are appreciating our Bay Area Art Roots with this new Whirligig Interview with Jan Rindfleisch. 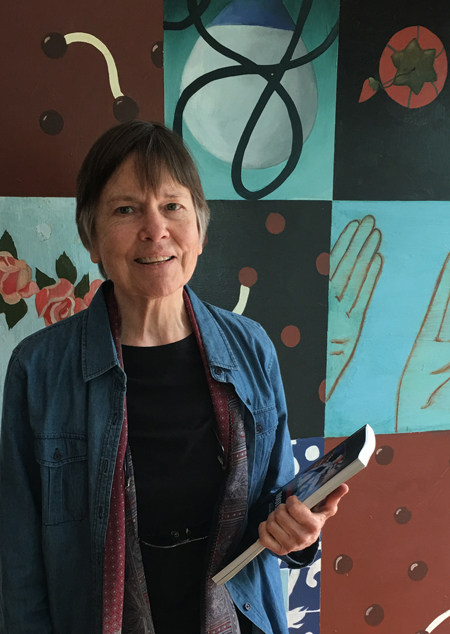 Jan is an artist, educator, writer, curator and cultural worker. She was the executive director of the Euphrat Museum at De Anza College in Cupertino for 32 years. During that time she laid the groundwork for an engaged and inclusive museum environment by continuously tapping the diverse local voices of Silicon Valley. Jan continues her work as a community builder with Roots and Offshoots: Silicon Valley’s Arts Community, a history of the art of the greater South Bay area from the post-Mission era artifacts of our First Nation peoples to the artists and activists that have made the western/southern half of the Bay Area the rich and vibrant scene it is today. Kent will exhibit new works from three print series: Conditions narrate states of being and coping strategies. Nests is a series of one-of-a-kind experimental prints. Cells explores imaginary living organisms and microbiome. Nanette will exhibit four images from On Longing, a series of 50 unique monoprints completed this last summer. 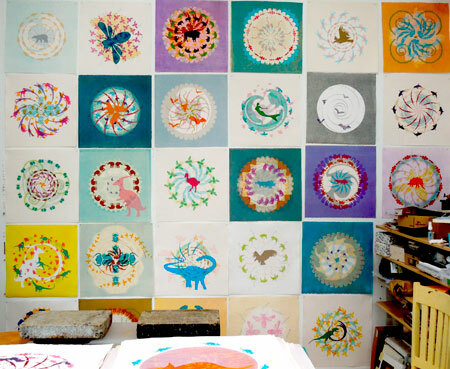 Each print is a mandala which contemplates and celebrates the natural world. The series takes its name from Susan Stewart’s book: On Longing: Narratives of the Miniature, the Gigantic, the Souvenir, the Collection. The Art Party is discussed in the Mercury News, where Nan’s work is also featured. Photo of the studio while the On Longing series was still in-progress, Spring 2016. Of course, we are trying to make sense of the upcoming November election. Thus we have created a new and improved version of Meaning Maker U.S. Presidential Elections Edition. Download your free copy at the Meaning Maker website, and distribute as you will. 275A Linden Street in Redwood City from Oct 7 – Nov 13, 2016. Opening Reception: Friday, Oct 7, 2016, 5:30 – 7:30pm. This Summer we hand-delivered Art Viewing Experience Edition and U.S. Presidential Elections Edition to two significant events in Europe: The 9th Berlin Biennale for Contemporary Art in Berlin, Germany; and the opening of the Tate Modern Switch House in London. Other European museum and gallery locations which experienced bursts of Meaning Makers include: Brussels, Paris, Dresden and Prague. Don Drake and Kate Jordahl invited Kent to write the afterword for Kate’s True North Editions, one poem book, no. 6, featuring Don’s poem, End. The book launch for one poem books no. 5 and no. 6 will be at Don Drake’s Studio, Dreaming Mind, on Saturday, October 8th from 2 – 4 pm. There will be readings! 5664 Sun Ridge Court in Castro Valley, CA. Kent is also showing in Al-Mutanabbi Street Starts Here: In Defense of Culture at the San Francisco Main Library, Skylight Gallery, 100 Larkin Street, from September 17 – January 1, 2017. The Future, an artists’ book collaboration between Nanette and Nora Raggio, will be showing the month of October in Words|Matter, Chicago. Nanette’s Storyland v2 was invited for exhibition in Shapeshifting Texts, International Conference on Digital Media and Textuality in Bremen, Germany. Her print, Propagare, was exhibited at the Graphic Arts Workshop, Scuola Internaziale di Grafica in Venice, Italy; and she received a juror’s award for her needle felted book, Between Us Two, at The Art of the Book, Sebastopol Center for Art in Sebastopol, California. Our collaborative photo book, CSI: Las Vegas, was included in 23 Sandy Gallery’s summertime Wanderlust exhibition and subsequently acquired by UCLA’s Fine Arts Library. 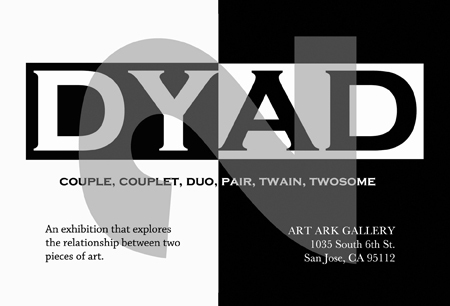 DYAD is a group show of thirty local artists who have chosen two pieces of their art to exhibit together as a unit. The theme of the show is intended to create an exhibition of paired works that suggest a dialogue or create a dynamic interaction; be it complimentary or opposite, attraction or repulsion or somewhere in between the works are attempting to engage each other as well as the viewer. Reception: Friday, February 3rd from 6-9pm with live Classical Guitar by Gene Torchia. Gallery is open by appointment only. Gualala Arts presents Dolled Up, featuring the works of Signe Barrar, Elaine Benjamin, Matthew Christopher, Eileen McGarvey, Jane Reichhold, Shannon Shea, and Nanette Wylde. 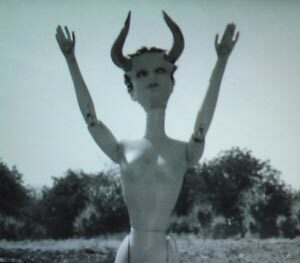 In this exhibition artists push the limits of how we understand and think about the doll using installations, video and animation, portraits, books, narratives and unique doll objects. The reception is Friday, January 7, 2011 from 5:00 to 7:00 p.m. The exhibition runs through January 30, 2011. While you’re in the stunning left coast towns of Northern California catch José Arenas’ book signing on Saturday, January 8 at the Phoenix Restaurant in Point Arena. 5:30 – 7ish pm. José’s book, A Little Piece of Happiness, was recently published by PreNeo Press’ Hunger Button Books . PreNeo Press will be participating in an Open Studio event at Linden Street Artists’ Warehouse in Redwood City. Across the street from the Target Shopping Center on the west side of El Camino Real (just south of Hwy 84/ Woodside Road). Behind the Chinese Restaurant.